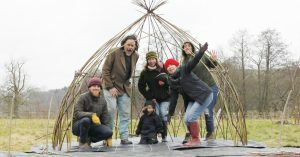 On Friday 9th March we were down at Cae Bodfach Community Orchard building a Living Willow Dome with assistance from the Willow Bank, Living Willow specalists since 1985. The Dome is adjacent to what will soon become a medicinal herb garden, which we started mapping out on the site a couple of months ago. Activities such as these really get to the heart of what permaculture is about – bringing communities together, while also enhancing biodiversity, building community spaces, sequestrating carbon, learning new skills, developing community resources, and so on. We hope you will join us to help out over the coming weeks as the medicinal herb garden is constructed. We will post details of the days we will be working at the Orchard here on our blog, as well as on our various social media platforms.